I owe Dismass a lot. Without Dismass, my son wouldn't have climbed the Kilimanjaro. More precisely, he wouldn't have made Gillman's point (at 5681 m), as he wanted to interrupt the nightly climb and I myself also wanted to relieve my vomiting son from his apparent pain. By contrast, our mountain guide Dismass clearly recalled my son's determination the previous evening: He wanted to climb the Kili. Period. And as Dismass saw no medical or safety reasons why my puking but strong son wouldn't make it, he sang songs in Swahili, asked his assistant to give my son a massage, and did everything humanly possible to keep him motivated. At the same point in time, I was busy breathing. Climbing. Surviving. So when Dismass asked for a bit of advice on how to create a website of his own, to support his work as a mountain guide in Kilimanjaro, I had no doubt whether I wanted to help or not. So here are my tips to Dismass Mariki. First, Dismass, you don't want "a website". What you want is attention, awareness and interest. So, like I said walking down from Horombo to Marangu yesterday: Forget about "a feedback form". Forget about programming, web design, asking anyone for help on "creating a website". Second, Dismass, what you want is "a blog"! That's how you create attention, awareness and interest. Through web comments, mainly from your customers, you'll get a lot better word of mouth and credibility than by claiming to have got any grade on a feedback form. And blog hosting sites are readily available, where you don't need to do any programming or web development at all. You just need to name your blog, upload a few pictures, and create contents. Third, don't forget about the contents. Do write regularly. But that shouldn't be a problem for you, as you possess a wealth of information. You can write about your next (109th, if I am correct) visit to Uhuru Peak. Or about any of the other topics I suggest below. Fourth, ask someone to take a look at the language of your blog entries. No, I haven't seen your writings, but I do know that many people would do well to get some coaching and inspiration on their usage of written language. It adds to the enjoyment of your readership, and it adds to your credibility. Fifth, pick a good URL and name for your blog. If you decide to host your blog on, say, blogspot, you could pick "dismass-on-kili.blogspot.com" and "Kilimanjaro Reflections By Dismass the Mountain Guide" as the description. Sixth, start writing. Write with pen and paper. Make your thoughts clear. Write more in the beginning. And, as a separate act from the writing, type in the blog entry when you happen to have web access. Seventh, ask your customers whether you can use their fresh pictures in their blogs. Here are mine for you to use, if you wish. But do ask every single future customer for their pictures. Eighth, ask your customers to which degree they're OK with being mentioned in your blog entries. Not at all? By first name? Nationality? Gender? Age? Perhaps with full name? Ninth, write at least one blog entry per trip up the Kilimanjaro. I'm sure you come up with new things, and it doesn't have to be a long article each time. Tenth, create a simple business card, with your name and blog address. Hand it out to your customers, ask them to visit your site, and to write a comment or two on what they considered to be the highlight of their trip. How To Pick the Right Route Up Kilimanjaro: Marangu, Rongai or Machame? Tent or hut, what's more comfortable? Do you want to summit, or do you want to chicken out and go to sleep? What clothes do I wear when in Kilimanjaro? Oh, and by the way: If anyone reading this blog would need a mountain guide in Kilimanjaro, here is Dismass's email address: dmariki (at) hotmail .dot. com. Dismass is amazing! I would love for him to create a blog. My husband and I are dentists and Dismass gave us great advise about how to go about setting up a trip to provide dental care to the children in Tanzania. 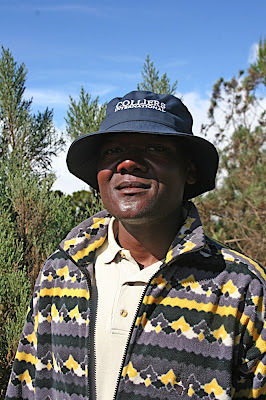 I would never try to climb Kili without Dismass and Jacob our assistant guide!